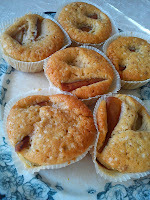 This recipe on these muffins gives an amazing taste and moist texture I have found in a small recipe book, which I got along with the weekly magazine "Alt for damerne" (Bagetillæg 07 2013). 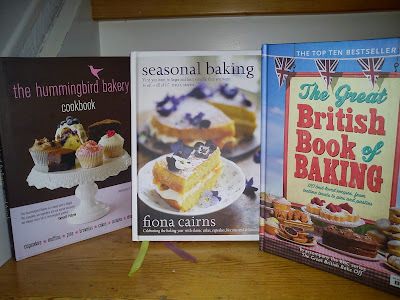 I must admit, that I only brought the magazine in order to get this small baking booklet !!! I will only buy a weekly magazine, if I get a book, interesting recipe booklet or DVD as part of the package !!!! I did not make any changes to the original recipe. I find the recipe to excellent to bake during Autumn time, as they contain both hazel nuts and pears, which is some of the produce, which you can harvest during Autumn. Heat up the (conventional) oven to 175'C. Spread the hazel nuts on a baking tray covered with baking paper. Roast the hazel nuts at 175'C for 10 minutes in the upper part of the oven. Remove the hazel nuts and lets them cool down. Once the hazel nuts are cold, remove the skin of the hazel nuts by rubbing them with paper towels. Blend the hazel nuts into hazel nut flour. Whip the butter with sugar and vanilla corn with a hand mixer on maximum speed for 5 minutes into a white foamy texture. Whip in the egg thoroughly, one by one. Add into the sour cream, without whipping to much. Mix together the wheat flour, hazel nut flour, baking powder, salt, cardamon. Add this mix into the cake mass without whipping to much. Finally add in the boiling water, again without whipping to much. Divide the pear into 8 boat shape for each pear, Cut each boat shape into two pieces. Stick two pear pieces into the muffin dough. Bake the muffins at 175'C in the middle of the (conventional) oven for 25 minutes. Mix the ingredients to the pie dough together in a food processor. Roll the pie dough dough out on baking paper, use a glass with a diameter of 8.5 cm to cut out small pieces of pie dough. Bake the pie dough at 225'C for 10 minutes in the middle of the oven. Remove the small pies and let them cool down. Mix muscovado sugar, sugar syrup, dairy whipping cream, cocoa powder and vanilla sugar together in a small cooking pot. Let it softly boil for 10 minutes. Remove the cooking pot from the heat and add the butter into the warm sugar mass. Stir well and let the butter melt. Cut the various nuts into bigger chunks. Add the nuts chunks into the caramel mass. 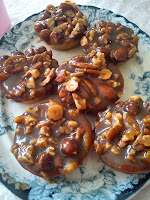 Fill the caramel nut filling into the small pies. 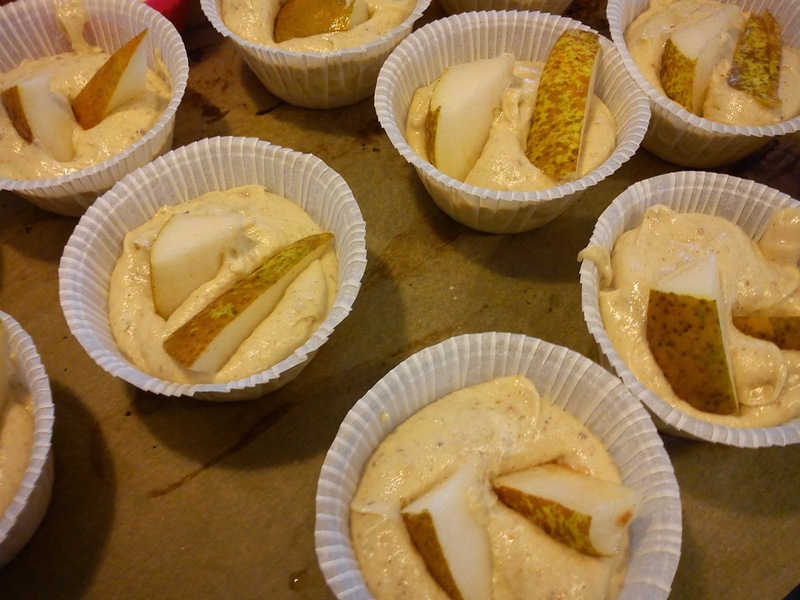 As there is more filling, it is a good thing to keep the pies in the muffins form to control the caramel nut filling within certain frames, otherwise the filling will run away and be every where. Place pies in the refrigerator for minimum 3 hours, before serving the pies. 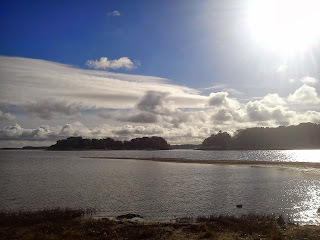 Yesterday afternoon I returned from yet a quick trip to England. Well not quick taking into account the amount of time spend going there, but quick in the term, that we had 3½ hours for doing some serious shopping. So to have 3½ hours of shopping in Colchester, my mother and I spend 19 hours sailing from Esbjerg to Harwich and another 19 hours sailing back from Harwich to Esbjerg. We made a similar shopping tour in January. So this time I knew exactly there all the relevant shops where and the best order of approach. I have a fascination of panna cotta as dessert, I think it is massive use of dairy cream as main and most important ingredient, which I am attracted to. I do not have the fascination of whipped dairy cream, I am not a big fan at all of dessert served together with whipped cream. It is actually a puzzling fact as it is the very same dairy whipping cream is the base for both type of products !!! Well, I have never made my own version of panna cotta. I have enjoyed many various versions of panna cotta being dinning out, but never in my own little kitchen. So I decided to start out with a standard panna cotta having only vanilla as the flavouring ingredients. And here I found this recipe on Isabella Smith's panna cotta med rabarberkompot. I have made two modifications. Instead of working only with dairy whipping cream, I decided to use 50% dairy whipping cream and 50% skimmed milk, so basically I reduced the fat with 50% !!! The second modification is, that I did not made any rhubarb compote specific for this panna cotta. I simply defrosted some rhubarb mass, which I had saved from making this classic rhubarb cordial. So instead of throwing the rhubarb leftovers away, I added sugar to desired sweetness, and then store this "rhubarb compote" in the freezer for later use. Start by softening the gelatine sheets in a bowl with cold water. Meanwhile pour cream and milk in a small cooking pot, add in sugar as well followed by the vanilla corn of the vanilla pod and the actual pod. Warm up this cream mass, it should not boil, let is boil gentle for 15 minutes, while you stir regular, so it does not burn. Remove the cream mass for the stove. Remove the vanilla pod from cream mass. Squeeze out the water from the gelatine sheets. Whip the cream mass and the gelatine sheets one by one, ensure they are melted and mix very well into the cream mass. Pour the cream mass into serving bowls or small glasses. Place the panna cotta portions in the refrigerator and let it gel, which takes minimum 3-4 hours. Before serving place 2-3 teaspoon rhubarb compote on top of the panna cotta. 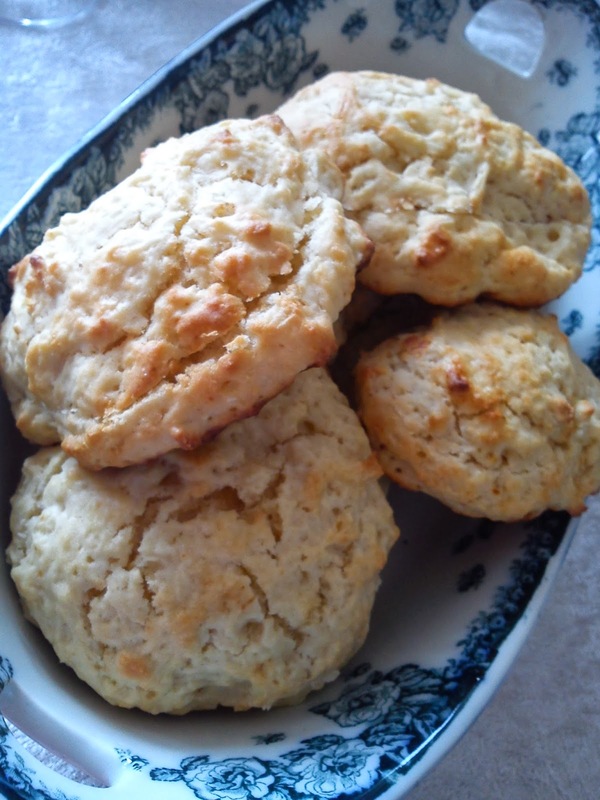 Rose Lemonade Scones a la "Lavender & Lovage"
The only minor hurdle about this recipe was, how to get hold of the most important ingredient in form of Fentiman´s Rose lemonade, as I not living in England, but here in Denmark. To overcome this minor hurdle you need to involve your surrounding network !!! My good friends from Horsens were going to England on Summer vacation bringing their own car, so they were "informed" to keep their eyes open for this specific lemonade. Luckily enough they found this lemonade and took it home to me. Later on I have located a wine web shop here in Denmark, which apparently should be selling this lemonade. So now I need to try our this "Danish option". Heat up the (conventional) oven to 250'C. Add the flour, salt, baking powder and sugar into a mixing bowl. Stir it well together. Add the rose lemonade and sour cream on top, and stir the mass together to a homogeneous mass, but do not over mix the dough. Place the dough onto a surface covered with flour and pressing out into a thickness of approx 2 cm. Place the scones a baking tray covered with baking paper. Glaze the scones with milk. Bake the scones in the upper part of the oven at 250'C for 10-15 minutes. Serve the scones warn with whipped cream and rose jam !!! 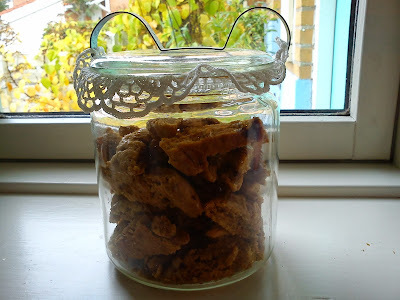 I have found this specific recipe on muscovado biscotti at Dansukker, and I have made no changes at all to this recipe. Another time I could easily imaging, that I would like to add some almonds pieces into the dough. The dark Muscovado sugar gives a wonderful brownish colour to the dough and an excellent taste to the final biscotti. 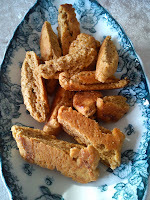 It is not the last time, that I will be making these biscotti. 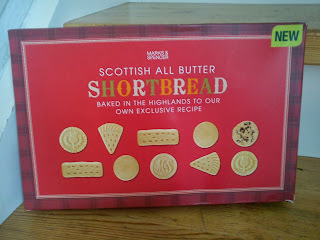 Mix butter and Muscovado sugar. I used a hand blender for this purpose. Afterwards add into the milk, flour and baking powder. Knead the dough together, until it was a homogeneous look. Place the dough in the refrigerator for minimum 30 minutes or longer. Divide the dough into 4 larger chunks, which is rolled into sticks. 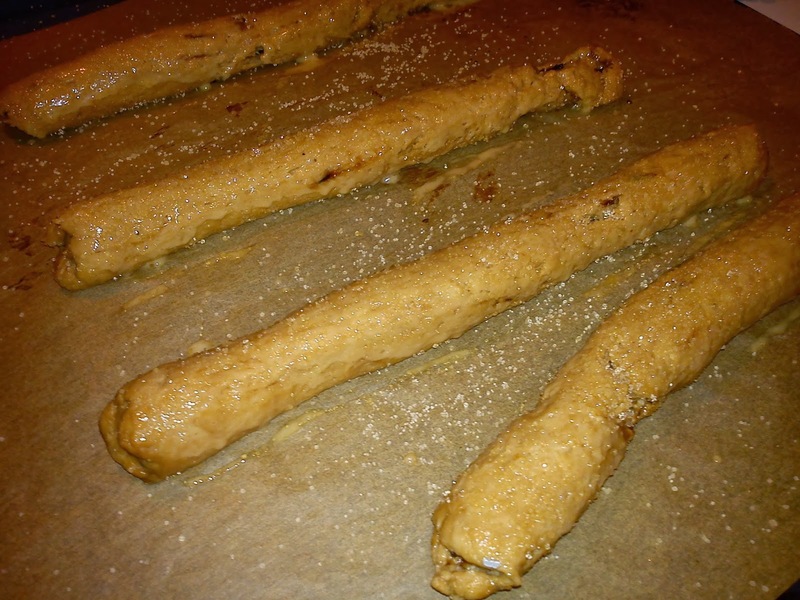 Place these dough sticks on a baking tray covered with baking paper. Glaze the dough sticks with beaten egg followed by sugar. Place the dough sticks in the middle of the oven at 200'C for 15 minutes. Remove the dough stick after 15 minutes baking, cut the stick into sloping cuts. Lower the temperature in the oven to 150'C, and bake the dough cuts in the middle of the oven at 150'C for another 15 minutes. Lower the temperature in the oven to 75'C. Keep the oven door slightly open. Bake the biscotti at 75'C for another 3-4 hours. Let the biscotti cold down, before they are stored in an airtight container. I am submitting this recipe on "fast" rye bread with fennel seeds as well into the monthly blogging event called "Tea Time Treats" being managed Karen from Lavender and Lovage and Kate from What Kate Baked. And for October Kate has selected BREAD BREAD as the theme. I call this rye bread fast, as it is raised with yeast instead of using a sour dough as raising agent. I am still taking big breaths, before I throw myself into the baking rye bread using sour dough, but some day I know I will do it !! 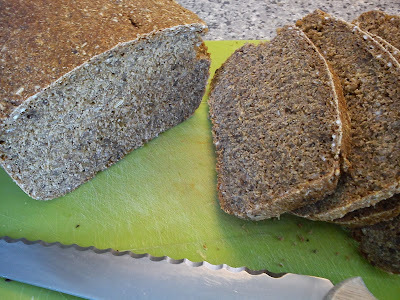 Rye bread is the traditional bread type here in the Nordic area, which we can consume for breakfast, lunch or in the evening. 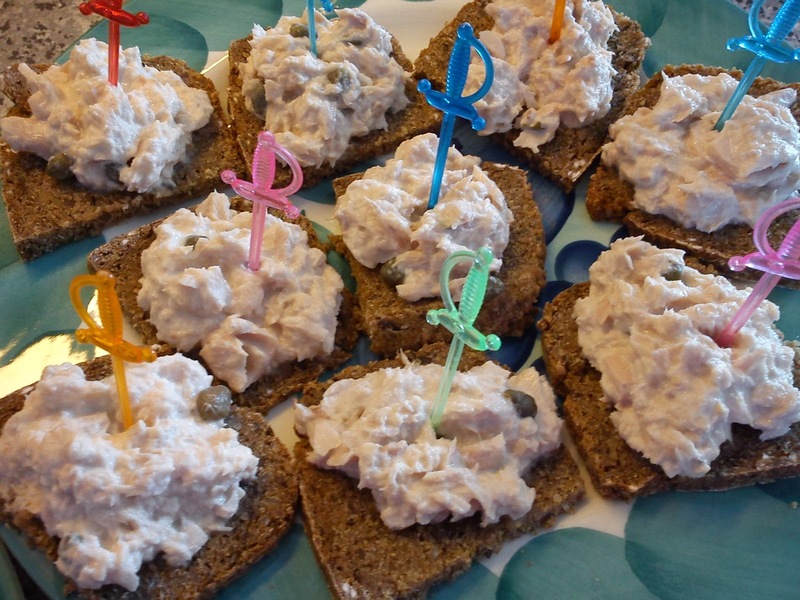 Rye bread can be eaten with canned fish, cold cuts or various cheese type. 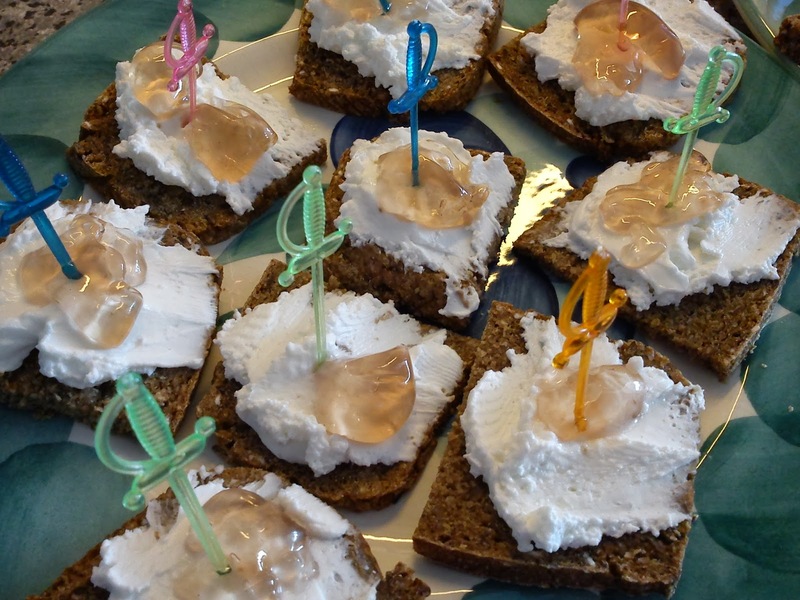 And rye bread is the bottom layer of the well known Danish open sandwiches. So yes, we eat a lot of rye bread here in Scandinavia. The original recipe I have found in a Danish magazine called BageLiv 2013. Pour water into a mixing bowl and dissolve the yeast in the water. 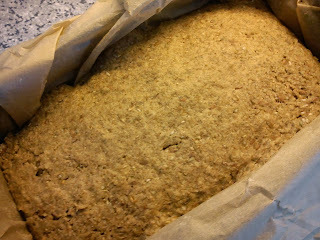 Afterwards add into the beer, syrup, salt, fennel seeds, rye kernels and linseed. Stir well. Add in the rye flour little by little. I used a hand mixer for stirring, while I added the rye flour. Cover a rye bread form with baking paper, and fill the dough into this form. Let the dough rest for 3-4 hours at room temperature. Place the rye bread in the oven at cold temperature in the lower of the oven. Heat up to 175'C. Bake the rye bread for 11/4 to 1½ hours. Let the rye bread cool down, before you start to the cut it. MEGA - MEGA MANY THANKs to all of my amazing girls friends, who took part this afternoon in my second pink fund raising afternoon tea for their support, generosity and positive response to my invitation. 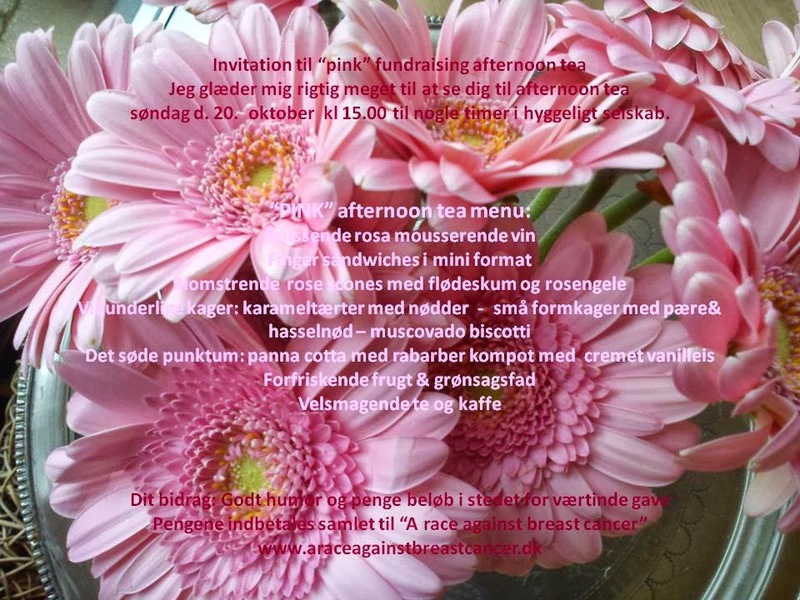 Together we collected 850 DKK, which has been transferred to www.araceagainstbreastcancer.dk, as this charity is accepting any amount of money without demands to specific value compared to other charities here in Denmark, which "demand" certain specific amount of money. We starter the afternoon with a glass of bobbles, mixing sparkling rose wine with mixed together with ½ teaspoon of blackberry cognac. I did not dare to add more of this cognac in order "to control" the overall alcohol taste. The first two eatable things were slices of rye bread with fennel seeds either with tuna salad or the great French combination of French soft goat cheese and French lavender jam (Fleurs de Lavande). The last option is so a great taste combination, which you really should try out in your kitchen !!! Afterwards we moved towards the scone part of the menu. 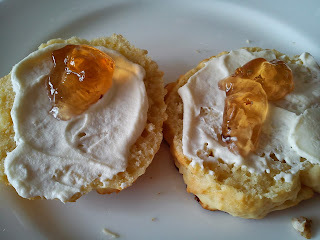 This time I add found a recipe on scones rose lemonade on a blog out here in blog country. I served these scones with the usual whipped dairy cream and another flower jam = rose jam. So now we were "warmed up" on the calorie part, ready to take on the cake part of this afternoon tea. The first cake was not a cake, but a muffin made with pear, hazel nuts and plenty of butter. The second cake was a cake in form small pies with caramel filling and nuts (the caramel was made with both dairy whipping cream and butter and the nuts was a mixture of four different nuts: hazel nuts, walnuts, almonds and pecans). The third cake was perhaps not a real cake, but more of a cookie type in form of muscovado biscotti. I do not know about you, if you are feeling filled up by now ? My guests still had to taste the dessert part of this afternoon tea menu. The first dessert was a panna cotta with rhubarb compote. 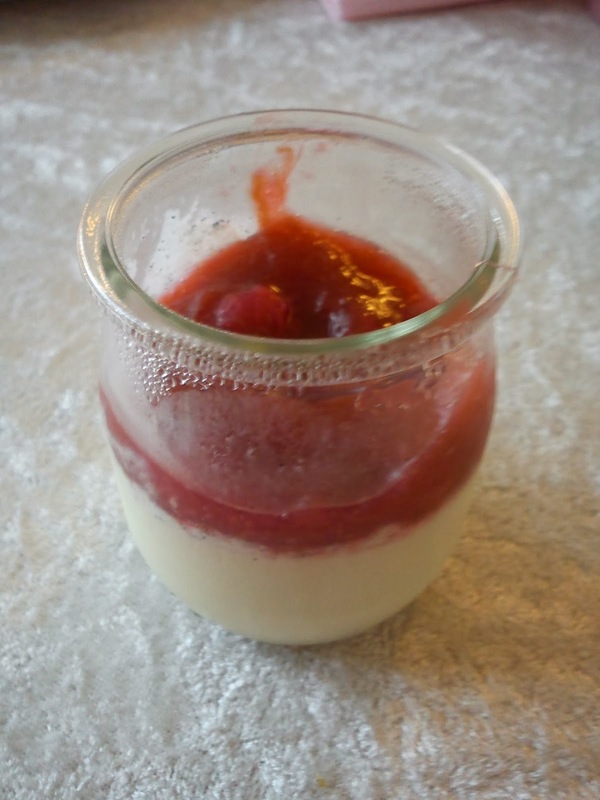 In order to "lower" the calorie content of this panna cotta, I had made it from ½ dairy whipping cream and ½ skimmed milk, instead of "only" dairy whipping cream. Uuuhmm, the combination with rhubarb compote was bringing in some wonderful bringing freshness into this creamy sweet dessert base. 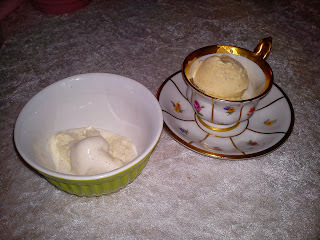 The other part of the dessert part was the "battle" between these vanilla ice creams: home-made vanilla ice cream a la "A Country Cooks Kitchen" versus ultra indulgent vanilla ice cream "artisan style". 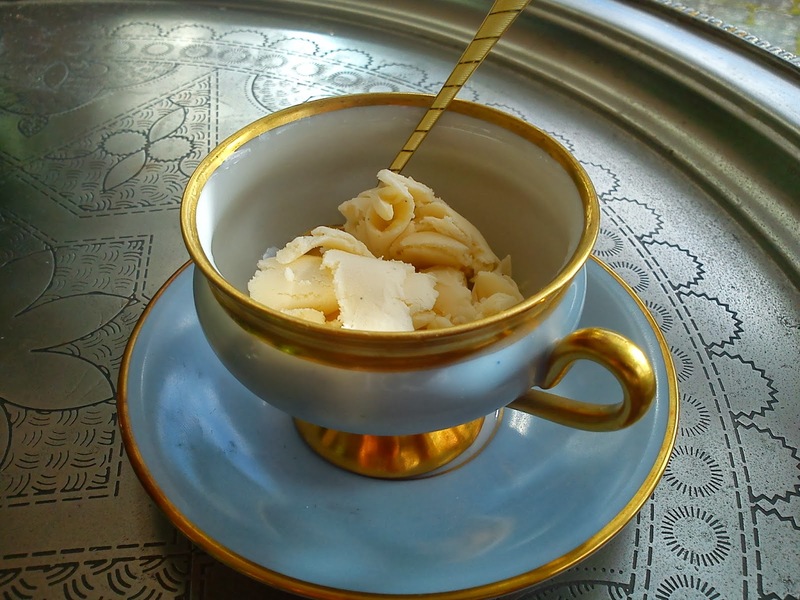 In this vanilla ice cream election the preference between all the people around the tea table was in favour of the home-made vanilla ice cream a la "A Country Cook´s Kitchen", as it had a great vanilla flavour and a faster cleaning in the mouth. The other ice cream "artisan style" was ropy in texture. As a finishing touch I served a fruit selection, so we could get some fibre to go with all the calories !!! Everyone was filled up more than 100% in the stomach after the afternoon tea, and I as usual skipped my evening meal !!!! I will as usual be sharing all the various recipes in the upcoming days/weeks, so look around on a regular basis, if you are looking for a specific recipes. Or leave me a comment, if you have a special interest, which you can not wait to make yourselve in your own kitchen, as I could re-adjust on the publishing order. 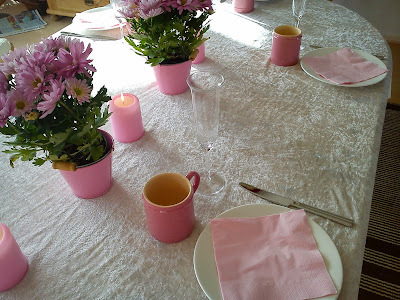 Based on last year´s great success among my good girl friends I decided to repeat the PINK afternoon tea, where I turn a bit maniac in my little kitchen baking and creating various eatable things, which is being served together with a glass of bubbles and plenty of freshly brewed coffee and tea. As some of you know, I involved my work colleagues in a PINK muffin fund raising recently, so now it is my girls friends being involved in similar activity. My girl friends have been invited on the "condition", that they bring money, which will be donated to "A race against breast cancer". 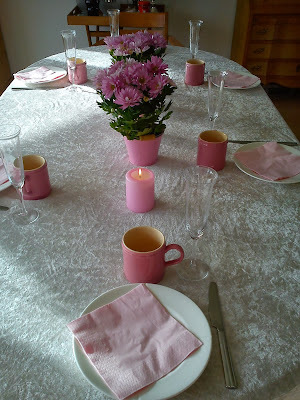 Today I am busy for preparing for tomorrow´s PINK afternoon tea, so I am only sharing the invitation with you. I will post photos from the actually tea table tomorrow evening with, so you can see, that we have been enjoying. I have been baking muscovado biscotti, rye bread with fennel seeds, small pies with caramel layer and various nuts, muffins with hazel nuts and pear and right here now I am making panna cotta, which will be served with rhubarb compote. 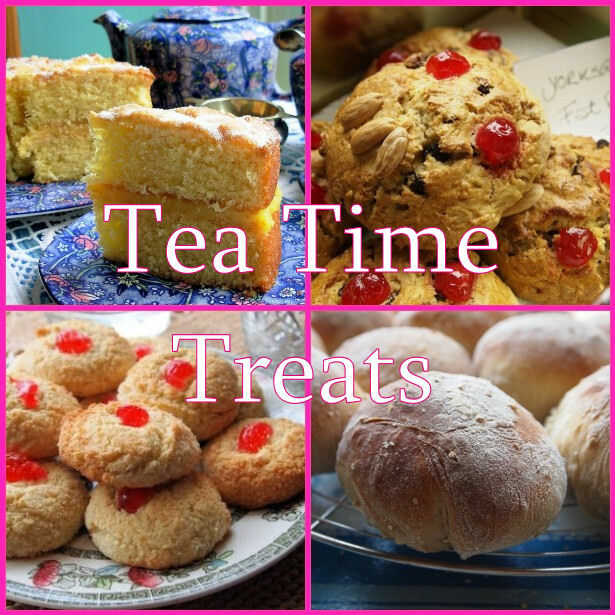 Tomorrow I "only" need to bake scones, make two types of rye bread sandwich, clear the entire kitchen living room after today's maniac activities and lay the tea table !!! Here in October I was walking the second part of the Gendarmstien (The Gendarme Path), which is a walking path of 74 km between Padborg and Høruphav. Gendarmstien is located on the boarder between Denmark and Germany, and is where the boarder control force (Gendarmes) walk on foot between 1920 and 1958, after the relocation of the boarder between Denmark and Germany took place in 1920 based on the results of the boarder vote. 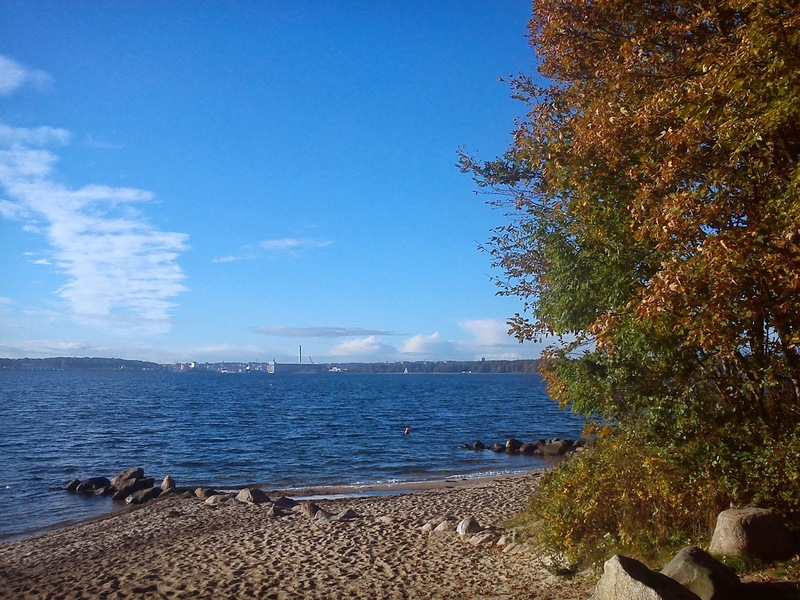 The first part of the tour let us to Kollund in September, so the second part of the tour started in Kollund and continued along the Fjord of Flensborg. 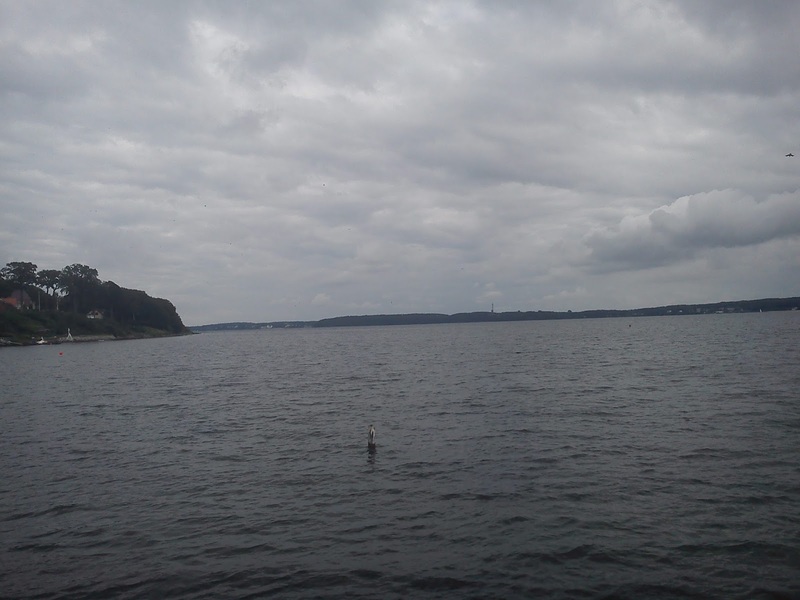 The North side of the fjord is Danish, while the South part of the side is German. 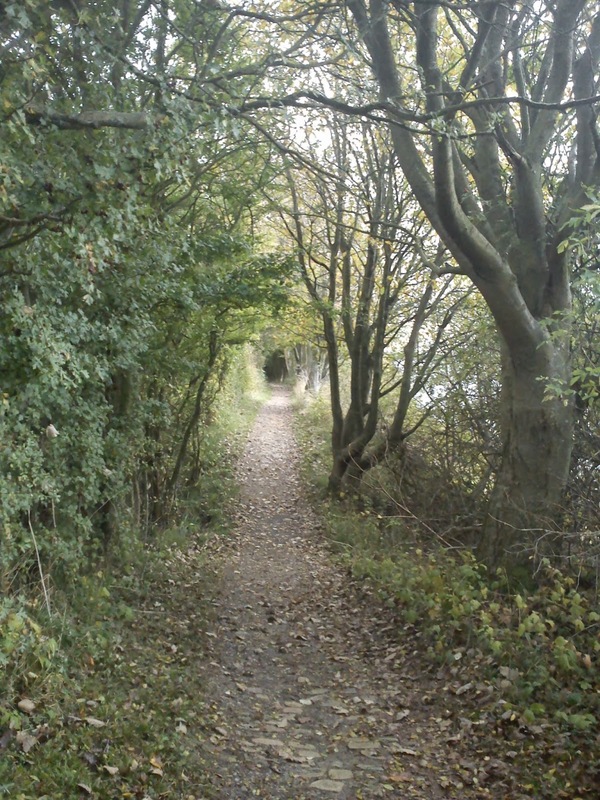 This time the distance was approx 16½ km, and we started in brilliant sunshine, as you see from my pictures. Towards the end of the tour we had a few drops of rain and some more grey sky. 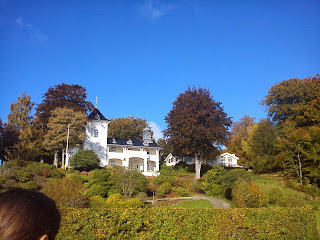 However, it was a great day for walking tour, being not too cold nor too warm. 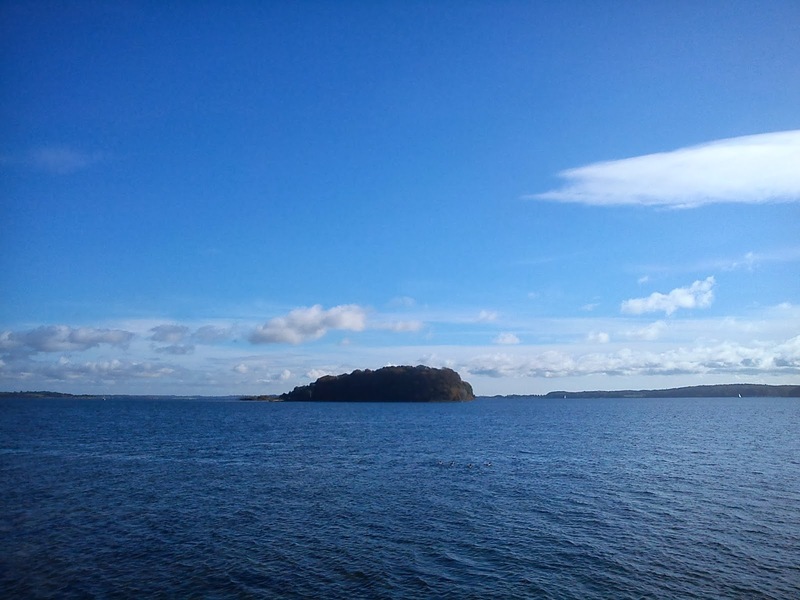 On the way to Egernsund we pass the small islands called Lille Okseø and Store Okseø, where the Danish queen Margrethe the first passed away due to plaque. 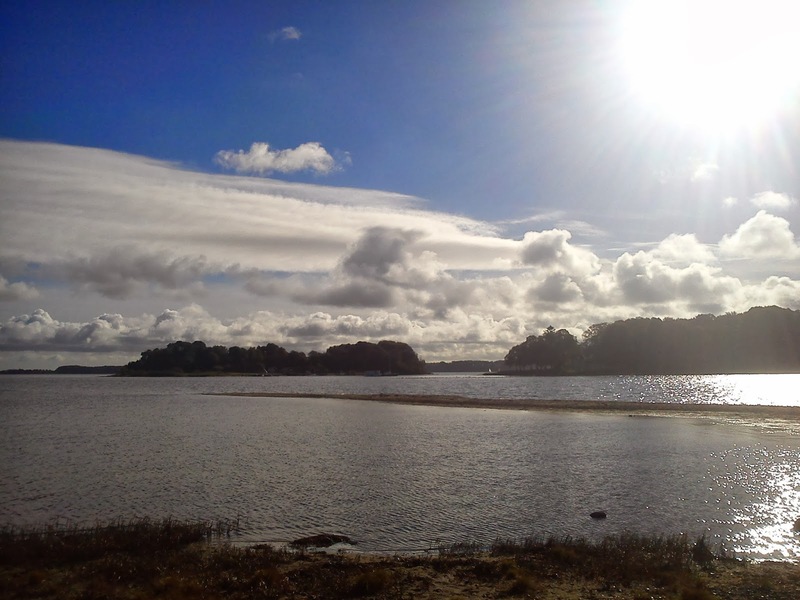 On the part of the path close to Egernsund we was walking through a forest of reeds on the very water edge of the fjord on top of eel grass. So somehow I felt like explorer fighting my way though the jungle in case a safe Danish version without dangerous animals lurking among the reeds. As we walking closer and closer towards Egernsund, we were getting closer and closer towards the brick area of Denmark. Around Egernsund the earth is perfect for making and burning bricks, so in this area, where have been 32 brick works in the "good old" days. Now there is only a hand full left. 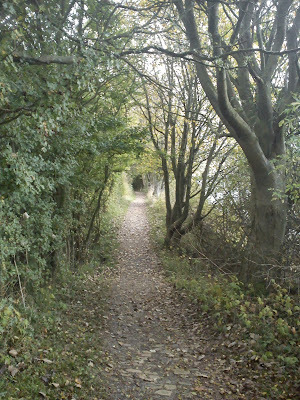 Anyway during our walk we noticed, that bricks had sometimes been used as pavement on the path. And along the water edge of the fjord bricks were laying around. After my first attempt on making fruit and mixed seed flapjacks for the monthly Tea Time Treat blogging event I have become a little attracted on these flapjacks. Some how they remind about one of my childhood favourite in form of mixing oat flakes with sugar and when just eating the dry-mix as a "sweet treat". Flapjacks are containing these two things combined with yet another good thing butter - plenty of butter ! 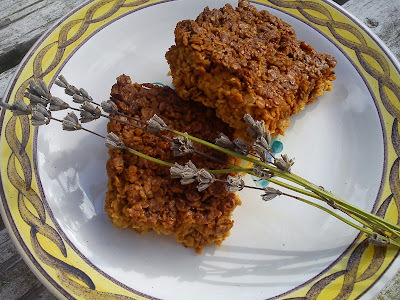 So when I was looking through the September 2013 Tea Time Treats round up, I found an interesting recipe made by Lavender and Lovage made from lavender honey, oat flakes, sugar and butter, and I just knew at once, that I needed to try out this recipe, as I have am having an attraction towards using flowers in my food. I decided to add in some extra dried lavender, doing my best to constraint myself keeping the dosage down to 1/4 of teaspoon full. I think this extra addition of lavender would give my good girl friend in Horsens a serious nightmare, when she reads this post on something containing lavender !!!! as she is still recovering from these meringues with lavender and orange bloom. Cover a 20 x 25 cm baking tray with baking paper. Melt the butter, lavender honey, salt, sugar and lavender together in a small cooking pot over medium heat, until it is bubbling. 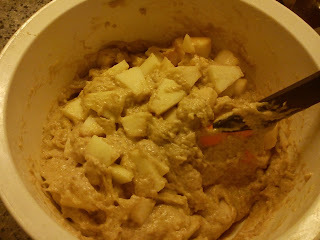 Add the oat flakes into this mass and mix everything well together. Add this mix into the baking tray and use the cooking spoon to press the mass even into the baking tray. Bake the flapjack at 200'C for 20 minutes or until the flapjacks are just browning around the edges. 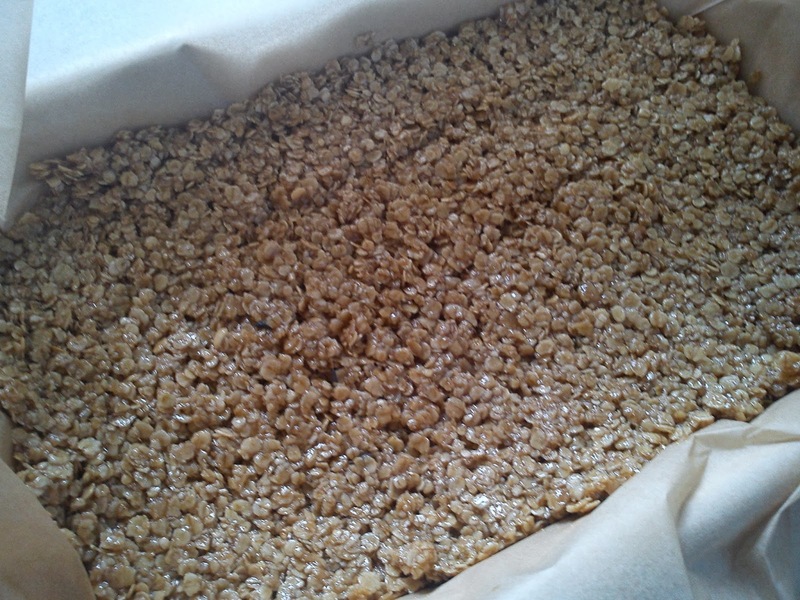 Use a sharp knife to cut the warm flapjack mass into squares. Let the flapjacks cool down in the baking tray, before storing them in a airtight container. I have been busy again "producing" vanilla ice cream, just like last week-end where I made this home-made vanilla ice cream a la "A Country Cook´s Kitchen". Yesterday I made yet another vanilla ice cream, which is more "artisan style" following the guidance from my work colleagues, which are some of the world leading ice cream experts ! So this recipe is calculated according to the "golden rules" for good ice cream having higher level of milk solids non fat, correct "ice cream factor" and some "magic" powder (functional food ingredients). 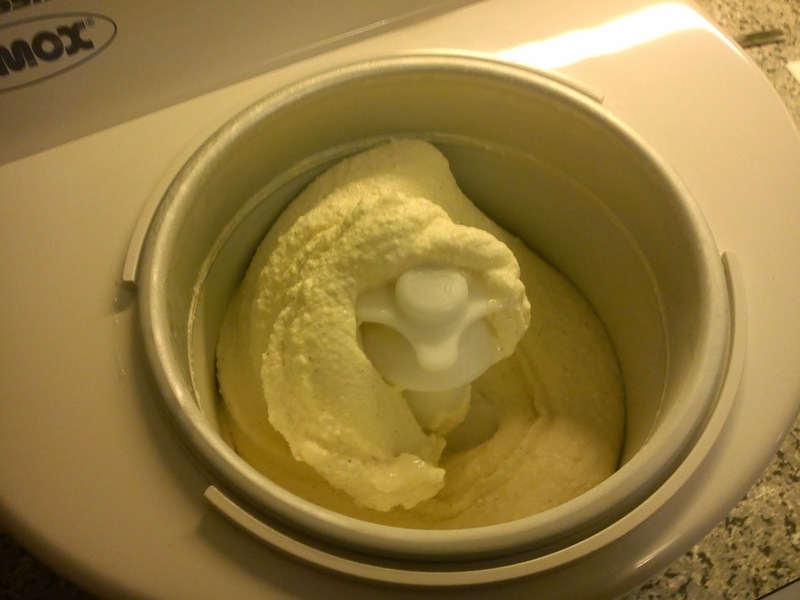 It was also due to the casted votes from some of my colleagues, that the first ice cream election tuned out to be vanilla cream, as I should build up a good understanding of my ice cream machines capabilities. So I am planning to bring a portion of each ice cream to work, so we can have a sensory evaluation and select the best of these two vanilla ice creams. This is also the reason, why I have kept similar fat content and relative sweetness in each recipe. I will describe this ice cream as being ultra indulgent in both cream taste as well as very rich in mouth coating texture. I do not know, if I dare to write, that this ice cream is a little too rich in texture, so I need to work on version having less of a fat content. You should be aware of, that the ice cream is having a calorie content of 1000 kJ/100 g and a fat content of almost 16% fat. 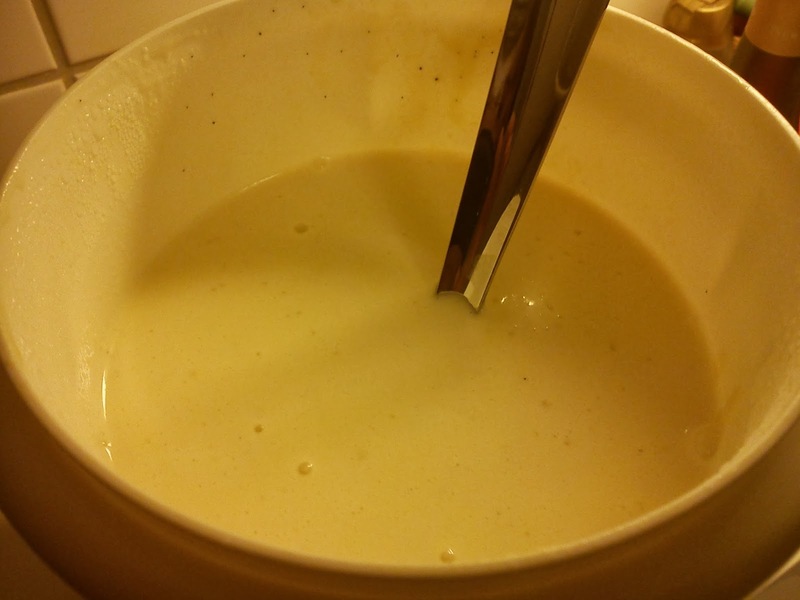 Mix the milk and cream together in a small mixing bowl. Dry-mix the skimmed milk powder, sucrose, glucose syrup powder and ice cream stabiliser together. Whip the milk-cream together and add the dry-mix in as you whip. 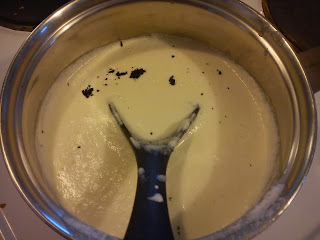 Pour the ice cream mix into a small cooking pot. Remove the vanilla seeds from the vanilla pod. Add both vanilla pod and seeds to the ice cream mix. Heat the ice cream mix over low-medium heat until hot, but not boiling. Remove the vanilla pod from the ice cream mix. Whip the ice cream mix. Pour into your ice cream machine and freeze it into ice cream. I have some amazing work colleagues, which yet again participated in a new muffin fund raising event for the fight against breast cancer as well as their positive response to this idea of mine. 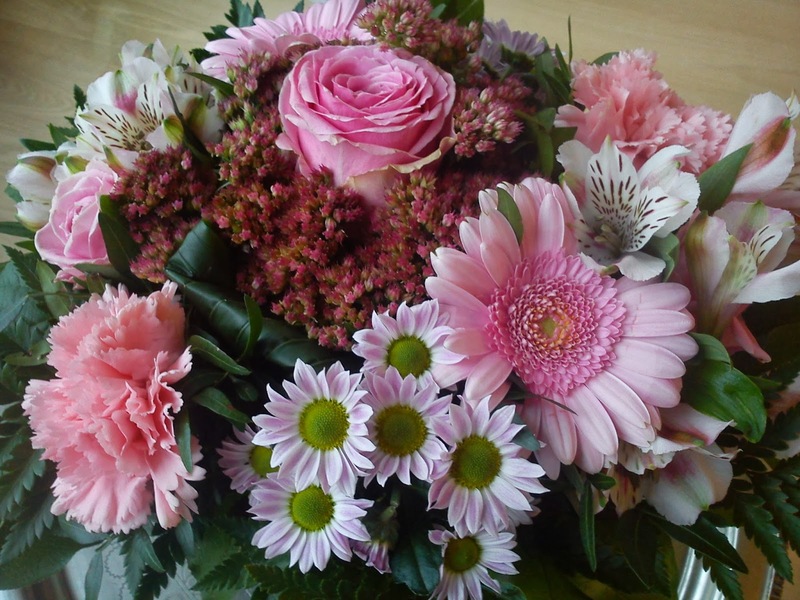 So a huge thank you to all of you for your support :-) as well as your nice comments on my PINK attire. I was addressed as "lady in pink" by several colleagues yesterday at work. In October month there is a lot focus here in Denmark (like many other places in world) on breast cancer as well as collecting money to support both research in this sickness as well as support to women living with it. As my colleagues showed great support at last year´s pink muffin sale, I decided to involve them again. 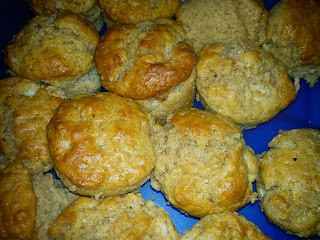 It is becoming more and more easy to step out my own comfort zone "demanding" money from them prior to eat my muffins. This year I had baked muffins with Danish apples and cinnamon. As usual I leave it to each of my work colleagues to make up their own mind on the amount of money, they like to donate. And if they for suggestion, I suggest 10 DKK as starting point. I received donations from 15 work colleagues, which in total donated 344 DKK, which equals a price on 22.93 DKK for each muffin, which is almost 7 DKK more compared to the last year´s fund raising, where a muffin selling price was 16.05 DKK. As any amount of money (not fixed value) is accepted by www.araceagainstbreastcancer.dk, they are receiving the collected money. 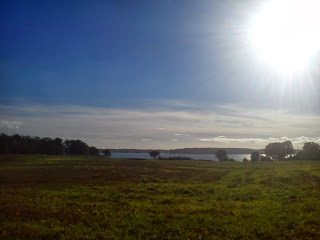 Almost a month ago (as time is running) two friends and I were walking the first part of the Gendarmstien (The Gendarme Path), which is a walking path of 74 km between Padborg and Høruphav. 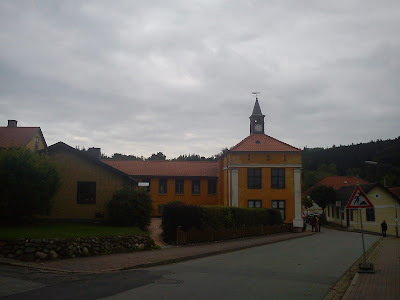 Gendarmstien is located on the boarder between Denmark and Germany, and is where the boarder control force (Gendarmerne) walk on foot between 1920 and 1958, after the relocation of the boarder between Denmark and Germany took place in 1920 based on the results of the boarder vote. 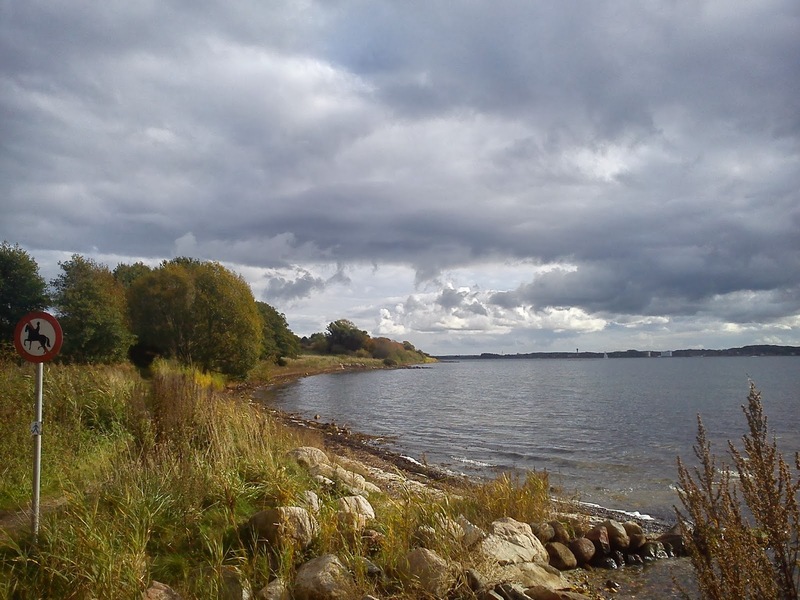 Between Padborg and Kruså the boarder is placed on land marked with boarder stones, and after Kruså in Eastern direction the boarder is the Fjord of Flensborg. The distance was approx 10-12 km. The weather was mostly a grey sky with plenty of clouds, which sometimes looked like it would start to rain, but we managed to spend the entire day without any rains drops hitting us. It is one of those days, where the weather looks grey and rainy, if you spend it indoor, but is you are outside you are having a completely different view, yes it is grey, but you do not have to cover up in rain clothes, so it actually perfect weather for a walking tour. I am looking forward to taking the second distance today Thursday. 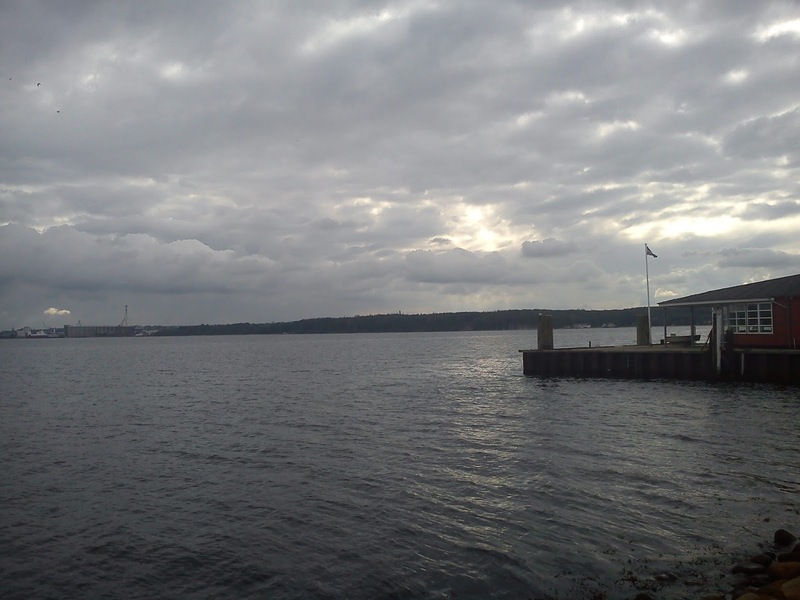 Mid September I and two other rowers were spending a weekend rowing on Limfjorden having the rowing club of Nykøbing Mors as base. 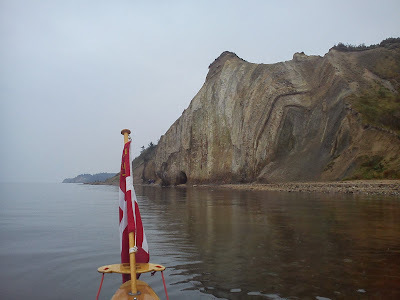 Saturday we were very lucky with the weather, so we managed to row around the the little island of Fur. On the northern side of Fur you can see some amazing cliffs with various earth layers dating many millions year ago and showing off layers of old volcanic eruptions. 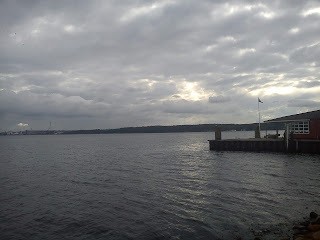 After a wonderful day spend rowing 46 km in total, we went to a restaurant in Nykøbing Mors called Belle Epoque to relax and enjoy an evening meal. All three of us selected fish as main course. This evening consisted of halibut, green asparagus, Norway lobster tails, new potatoes and a creamy fish sauce. When we first saw the portion, we found it to be looking quiet small. Anyway as we start digging into the meal, it was much bigger from the inside than it looked from the outside. The shear height of the halibut was very BIG. The waitress was young, but giving us a good level of service. The only thing was, that she needed to know more about, where the different parts of the meal was coming from. 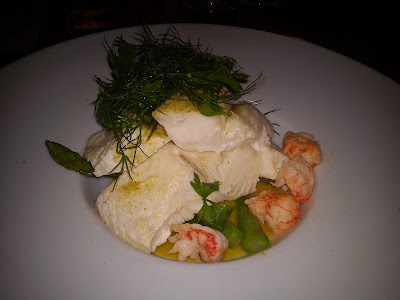 At other restaurants of this type, the waiter will always be telling, where the various part of the course are coming from, like the asparagus from the local farmer and the Norway lobster tails from the island of Læsø !!! So I more or less let her go to and from the kitchen with my many different questions relating to the meal. In total I ended to with paying approx 45 € for food and 1/3 of a bottle of white wine. I will give this fish meal 4 stars. Home-made vanilla ice cream a la "A Country Cook´s Kitchen"
So yesterday was the BIG day, where I used my brand new Nemox ice cream machine for the very first time in my little kitchen. And it was a good day to do, as it was grey and rainy outside, so what better way to comfort yourself inside hidding away from Autumn making ice cream !!! So it was actually a tie between vanilla and liquorice. Some of my colleagues (being very technical food people) taking part in this vote, all more or less voted on vanilla, so I/they could get an understanding of my ice cream machines capabilities. So therefore I set my heart on making vanilla ice cream, as I already have shared a liquorice ice cream recipe with you. Even though, that my good friends in Horsens are very un-happy with this decision of making vanilla ice cream. I actually received a comment from Horsens demanding a recount of all the votes !!! 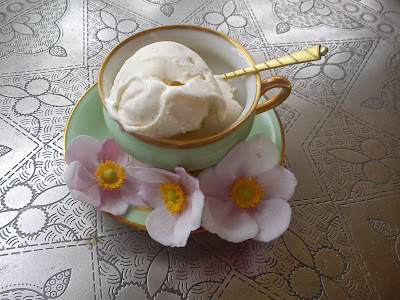 Even the recipe on the vanilla ice cream has been a MEGA HUGE discussion point at work between my colleagues and I. I have found this vanilla ice cream recipe in the brilliant cooking book called "A Country Cook´s Kitchen" by Alison Walker. However, according to my colleague this recipe is having too little amount of milk solids non fat combined with a too high level of dry matter and no magic powder inside (functional food ingredients) !!!! 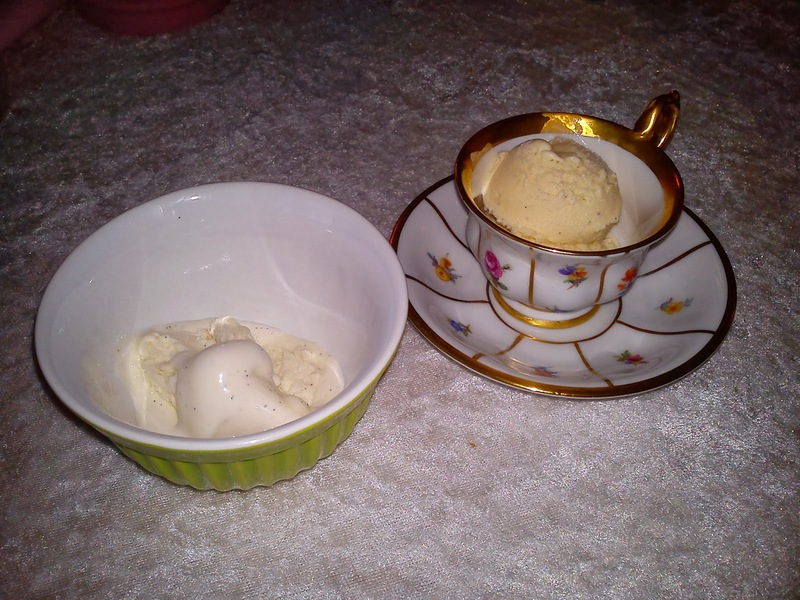 So here in October I have decided to make two vanilla ice creams, this recipe here and a correct designed vanilla ice cream made with kind help by my work colleagues !!! This ice cream is described as being RICH, and this is term fitting perfect to so many areas of this ice cream. The taste is wonderfully rich (the best tasting vanilla ice cream I have ever had), the calorie content is rich (1000 kJ/100 g) and the fat content is rich (almost 17% fat). remove the seeds from the vanilla pod. Add both vanilla pod and seeds to the milk in a small cooking pot. Heat this vanilla milk over medium heat until hot, but not boiling. Remove the vanilla milk from the heat and it let stand cold for minimum 30 minutes, so the vanilla can infuse the milk. Whip together egg yolks and sugar in a mixing bowl until it is a white thick mass. Add the vanilla milk into the egg-sugar mix and mix everything well together. Pour this mix into the cooking pot over low heat, stirring it constantly until this mixture has thickened enough to coat the back of the cooking spoon. Be careful not to overheat this mixture, as it will curdle. 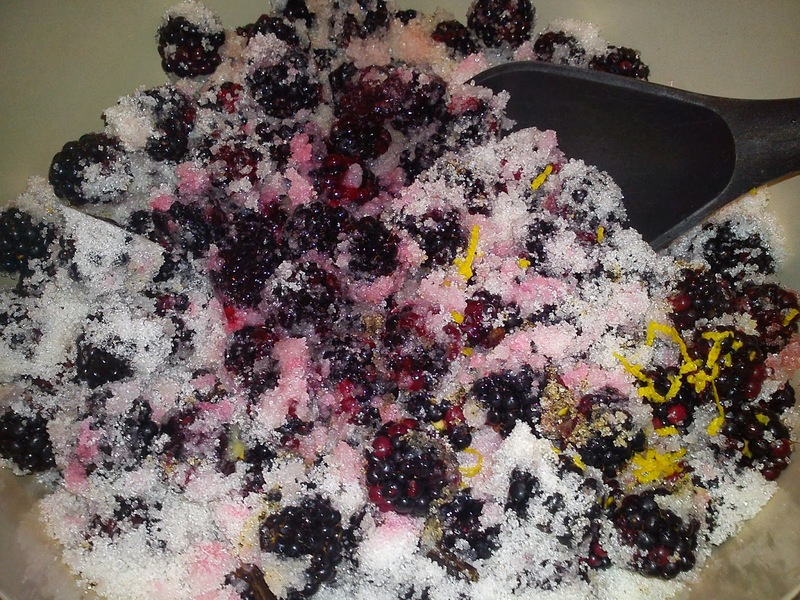 Transfer the mixture through a sieve into a clean bowl, which is stored in the refrigerator until it is cooled down. Stir the whipping cream into the mixture. Blackberry season is here again, so you should really do an effort and go hunting for these wonderful berries in your local forest. I am so lucky, that I have my very own local supplier of blackberries, which on a regular base brings picked blackberries to me at work, so I only have bring them home to my kitchen and make amazing things with these blackberries. 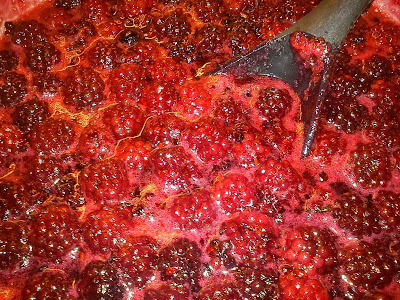 Blackberry jam is one of my favourite, and with with this recipe I now have four versions of blackberry jam. Heat up the blackberries and jam sugar in a cooking pot together over low heat in a cooking pot. Add in vanilla corn and pod (cut into smaller pieces), lemon juice and lemon zest. 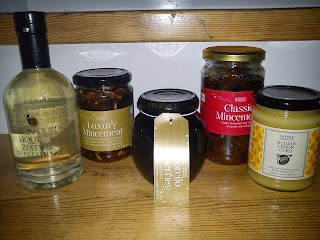 Taste on the jam. 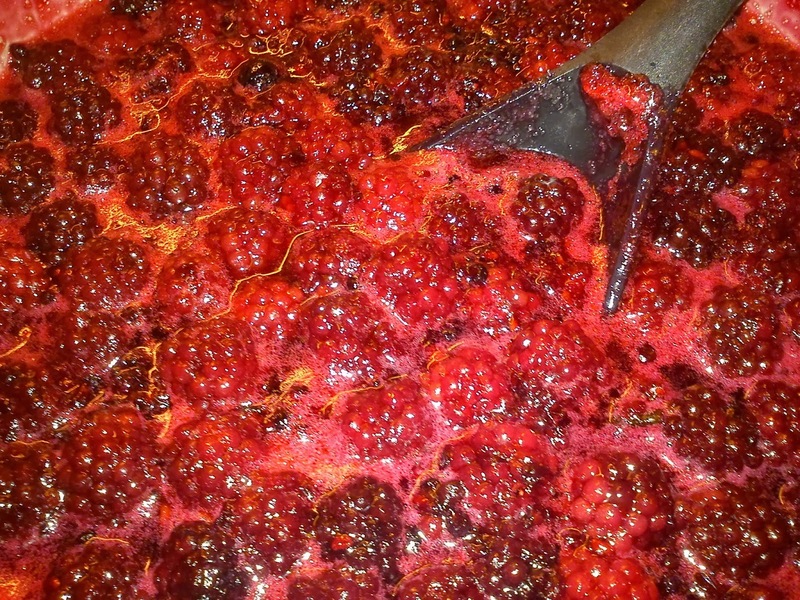 If you find it too be to sweet/matured in taste, you can add some vinegar to bring freshness back to the jam. I normally do this in smaller steps, so I can fine tune the flavour profile to my preference. 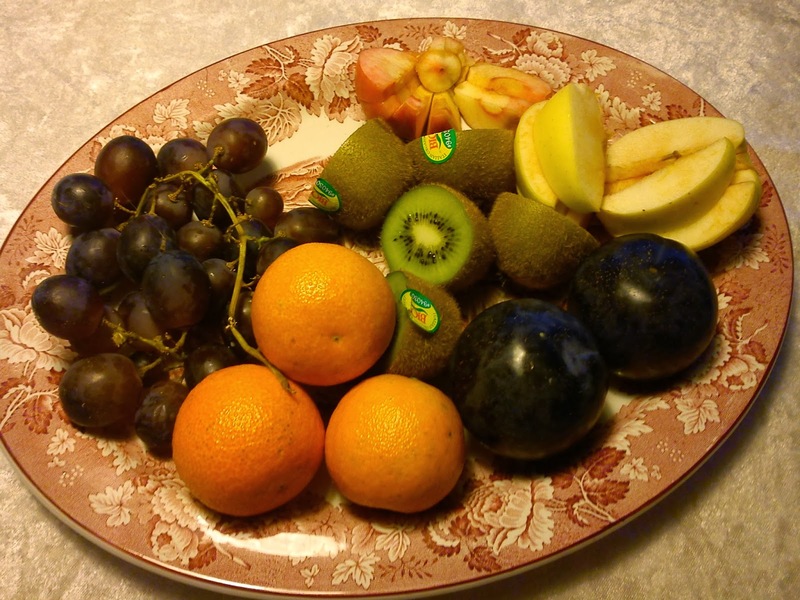 It is more easy to add some extra, than to remove an overdose of something.